The Pedestal Joust turns your guests into gladiators as they climb into the arena, armed with padded jousting poals and headgear! Once the combatants are stationed on their corresponding pedestal, the throwdown begins as both players attempt to knock one another off their pedestal with their jousting poles! 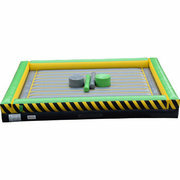 The Pedestal Joust is 25' by 20', features padded walls for safety, and is suitable for players of all ages. Always a thrill to participate in or spectate, the Pedestal Joust is sure to leave a lasting impression on all your guests and make your next party or event a total hit! Reserve yours today! © We Bring The Party, LLC. All rights reserved.